Drive-in racking is a specialist storage system designed to take advantage of all of the available space when storing large quantities of the same goods. Drive-in storage sees the removal of aisles and walkways between the stored goods, to allow more pallets or stock-keeping units to be stacked. Instead, the multiple aisles are replaced with a single access aisle, enhancing overall storage capacity. The design of drive-in racking has to be carefully considered to ensure the careful control of stock levels. The team at Stodec Products have years of experience designing, supplying and installing this type of storage system to ensure a solution that fully meets your requirements. 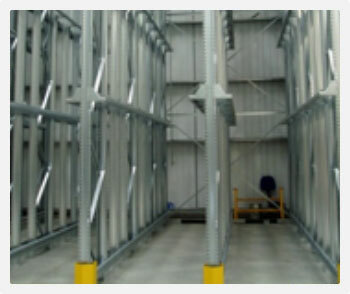 For any more information about drive-in racking systems, or to arrange a site visit so our team can measure up and advise you on the best racking systems to meet your requirements, simply get in touch today.